When writing the admissions essay for your residency, there are many things to consider. There are many factors that play into whether or not your essay is successful. The admissions essay is one of the most important factors that reviewers consider when accepting and rejecting candidates. It is the only subjective, personal part when you’re applying for residency. It gives your reader a chance to relate to you on a deeper level than that provided by the remainder of your application. Why Professional Residency Personal Statement Writing Help? Now that you have come this far in medical school, it would be unfortunate for the journey to be interrupted. You have worked hard in medical school to prepare yourself for this part of your career, and the residency is a crucial aspect that is a necessary link to the rest of your life as a medical professional. With so much riding on the residency admissions essay, why would you not seek help from a professional? Your success in the medical field is not about your writing skills, so why let them determine your success? Your future rides on your medical skills and knowledge. Let someone else, someone more qualified, write your residency admissions essay for you, and take the guess work out of the equation. Don’t let your writing skills stand in the way of your future. You just advance yourself in YOUR field, and let us help you by advancing our skills in our field. What Services Can We Provide for Your Residency Admission Essay? Residency admission essay writing: our writers each hold a higher degree that will be relevant to the specialty that you are applying to. They also fully understand the ERAS application process and what the different programs expect from their applicants. They work directly with you to make sure that your personal statement is written in an outstanding manner that will match what the committee wants to see. You will be able to request an unlimited number of revisions for your draft until you are fully satisfied with the content and style of your final statement. Residency application essay editing service: how your information is presented can be more important than what you have actually covered. Your style of writing and how persuasive you are can all affect how your application will be perceived. Our editors fully understand just how to get the best from your application and will provide you with a fully marked up version with all of the changes that they recommend for you. Proofreading services: simple mistakes can have a huge impact on your chances of being called for an interview. Many committee members will simply discard your application if there are any issues with your writing. Our proofreaders work through your writing from start to finish and will ensure that your work is totally error free. We never reuse content from any other clients’ essays. We provide assistance with personal statement for residency with providing guarantees that your residency admissions essay will be 100% unique and never plagiarized. We also listen to you very carefully to make sure that we are truly showcasing you in the best way possible. This is what truly makes your essay unique from any other. Personal statements: we can help you to tailor your personal statement to reflect just what the program expects of you. Our experts work with you to draw our your strengths and ambitions so that you will be able to present an effective and well written statement. Letters of recommendation: having another recommend you for a position is highly effective. However poorly written they can have completely the opposite effect. Our LoR writers fully understand just how to write a letter that is going to be highly effective for your application. Admission essays: many admission essays require you to answer a specific prompt. Our experts understand just what the committee will be looking for within the application essay and can help you to develop an impressive answer that will get you results. Scholarship essays: gaining funding for your education is not easy and scholarships are highly competitive. Our specialists know what each body is looking for within the essay and will help you to ensure that you reflect those expectations clearly. Statement of purpose: we can help you to identify everything from your reasons for application through to program goals and career ambitions. They will help you to put together an impressive statement of purpose that will get you the results that you need. CV or Resume writing: often you will be required to supply a resume with your application. Our expert will work with you to make sure that you show just the right skills, qualifications and experience that the program will be looking for. How Does Residency Personal Statement Writing Service Work? When you order residency admissions essay writing services from residency personal statements, your process begins with you being connected with a professional writer that is perfect for the job. We evaluate each order on an individual basis and match each order with the appropriate writer accordingly. All you have to do is give us any information that you wish to include in your admissions essay, and we will do the rest. You will be in contact with your writer from beginning to end, so any changes that you wish to make at any point will be implemented. Your writer will continue to work with you until your admissions essay is to your liking. We will also work with you on any deadlines that you have. 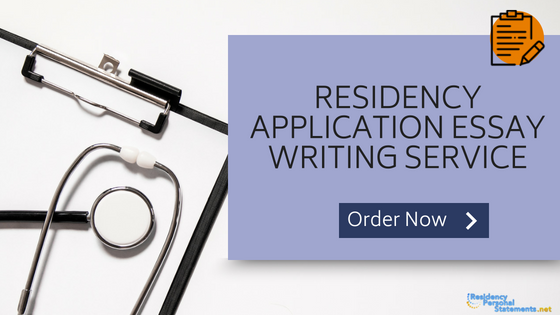 How Can You Benefit from Using Our Residency Admission Essay Services? We offer our services with a full satisfaction money back guarantee so there really is no reason not to use our help with your application. Our experts fully understand how to fully target the application and provide unique and perfectly written statements that you will be proud to submit. All work is proofread and supplied on time to you with a plagiarism report to confirm there is no copying. Complete the empty fields on our order form: you can make your order through our website at any time night or day. All information is kept secure and confidential. Pay for the service requested: we provide you some of the lowest and most competitive prices you will find for the high quality of help that we provide. All payments are done through secure methods. Discuss with your writer: they contact you and will work one on one with you so that they can draw out everything that will be required for your personal statement or other documents. Review the draft and request changes: on completion of writing you will be able to review the work and ask for any changes. We offer unlimited revisions until you are fully satisfied. Take delivery of your finished statement: delivered on time after proofreading with your plagiarism report. If you are required to submit a residency admissions essay, you do not want to go it alone. Residency Personal Statements is always here when you need them. It may be the best decision you ever make for your career in the medical field! Also, there is an interesting article about pediatric residency programs personal statement on our website, that could be useful for you. Submit a residency admission essay through ERAS that you can be proud of with the support of our professional writing and editing services.